Hochsauerlandkreis (meaning "Higher Sauerland District" in German) is a Kreis (district) in the east of North Rhine-Westphalia, Germany. 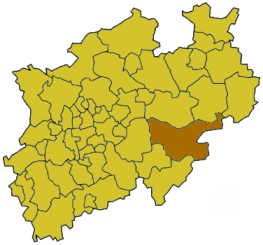 Neighboring districts are Soest, Paderborn, Höxter, Waldeck-Frankenberg, Siegen-Wittgenstein, Olpe, Märkischer Kreis. The district was established in 1975 in the reorganization of the districts in North Rhine-Westphalia by merging the previous districts Arnsberg, Brilon and Meschede. Geographically the district covers a big part of the Sauerland mountains, including the two highest elevations - the Langenberg near Olsberg with 843m, and the better known Kahler Asten with 842m near Winterberg. The coat of arms was inherited from the former district Arnsberg. It shows the eagle as the symbol of the Earls of Arnsberg. When their county lost independence in 1368 it fell to the bishops of Cologne, thus the sign on the breast of the eagle shows the Cologne cross.